Brian wrote: Install Note. We add a washer at the rear to space out rear connection a bit, and a longer bolt. Why? Rear suspension arc is a bit too much, this change makes it just a hair more linear in response. Brian, could you please give us some details about how the issue and the proper fix were determined? Brian, Meister offers a long travel coilover with 6kg/4kg springs. How do you think those would compare to your favorite Koni's w/Progress springs? I'm not looking for much drop, just a better setup than my 40K stock non-Bilsteins. Road use only, maybe a hot lap or two at Laguna when the Miata's are in town. MasonL705 wrote: Brian, Meister offers a long travel coilover with 6kg/4kg springs. How do you think those would compare to your favorite Koni's w/Progress springs? I'm not looking for much drop, just a better setup than my 40K stock non-Bilsteins. Road use only, maybe a hot lap or two at Laguna when the Miata's are in town. It's a tradeoff, depends on your priorities here. We started with the KONI and Progress Springs in this project, everyone loved it when this was just a street car. Now starting transition to race car and testing Meister setup with 7kg/5kg springs, which I am starting to appreciate, but other members of the team wanted us to go back to the Koni/Progress combo before handing keys to Magazine Editor from Grassroots MotorSports Magazine visiting us this weekend. I expect the higher spring rate Meister setup to be faster on autocross and track days for which we are building this project and I expect it will never ride as good as the lower rate Progress/Koni combo....and so far that's exactly what we got. Thus, if not racing every other weekend then I think most people are best served with the KONI and Progress combo for best ride with mild lowering and excellent damping from the KONI shocks. That Koni/Progress combo is still MUCH faster than stock, that was the 2007 factory MSR package that got banned from class as unfairly fast, easily over 1G lateral with good tires and sways, nobody needs faster than that in the real world. Nonetheless, if racing, the Meister setup should prove even faster with the 6kg/4kg or more, that's the natural benefit of the much higher spring rates, just don't expect the same ride quality when the springs are that stiff. Brian wrote: Yep, our OSKGIKEN is amazing but price tag way too high for this project, decided even our amazing Tomei unit was off the budget this time, so we grabbed a housing from the junkyard with the factory limited slip. Factory limited slip will be enough this time. Oh! I must’ve missed that part about finding one at the junkyard. This thread is likely setting the example that I hope one day very soon I will follow. You only missed it because I didn't get around to posting it yet. Got one out of local yard. Not CARB...yet. Talking with Joe at Dynotronics today and serious effort underway to get CARB tune this year! In the meantime we cannot do these for residents of California and even our own car for this project becomes a trailer queen in the meantime, it will ride our trailer to events at Laguna, etc. But I am optimistic about future CARB status for 2.5 conversions, Joe is working on the tunes needed and we are working on expanding CARB coverage with our Magnaflow header (currently CARB for 06-08 only), and working on new CARB midpipe that I hope will be ready by Spring. 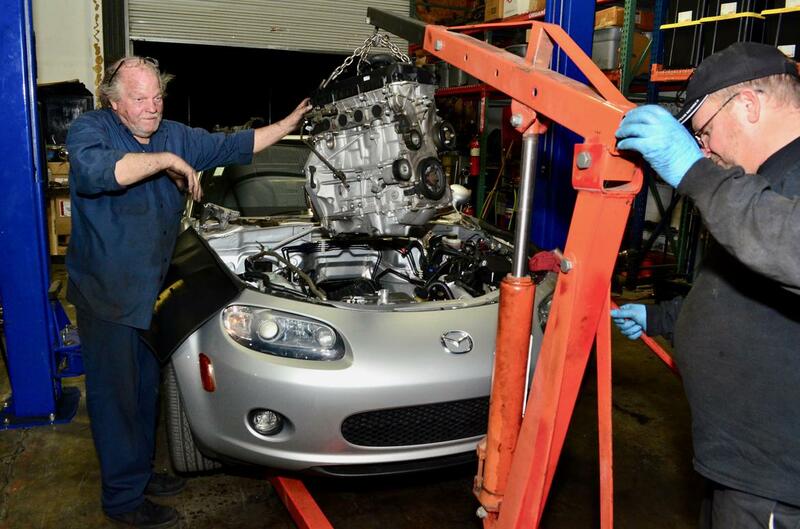 Cars need to be out of production for 5 years before we can get CARB on all years of NC for the exhaust bits but eventually plan to have all NC covered just like we currently have CARB midpipes for all years of NB Miata. All in all, the future looks bright and we hope to see NC customers everywhere have the option for 2.5 conversions as daily drivers everywhere in the USA. IN the meantime, check your local state rules before you start the project. The Swap in THREE PAGES OF pictures by Grassroots MotorSports Magazine CLICK HERE. Picture on customer install of 1Goal Intake, will be testing on dyno on our project at some point. Quiet here on this thread because the project has been at exhaust factory again for finishing work on CARB midpipe. Excited to finally get that in production, hope to have on shelf by Spring! A few weeks of hard driving in the MeisterR Coilovers with 7kg/5kg. First day started rough, sharp impacts seem to reach the driver regardless of the adjustment. BUT, they seem to break in with some miles and by the end of the journey I find this 7kg/5kg setup reasonable for the dual purpose owner looking for reasonable street/autocross/track value in a coilover setup. NEXT going in are the much higher rate MeisterR ClubRace with 10kg front/6kg rear, just in time for first competition event for this car this next weekend. By the way, instructions note not DOT approved, 'offroad use only'.